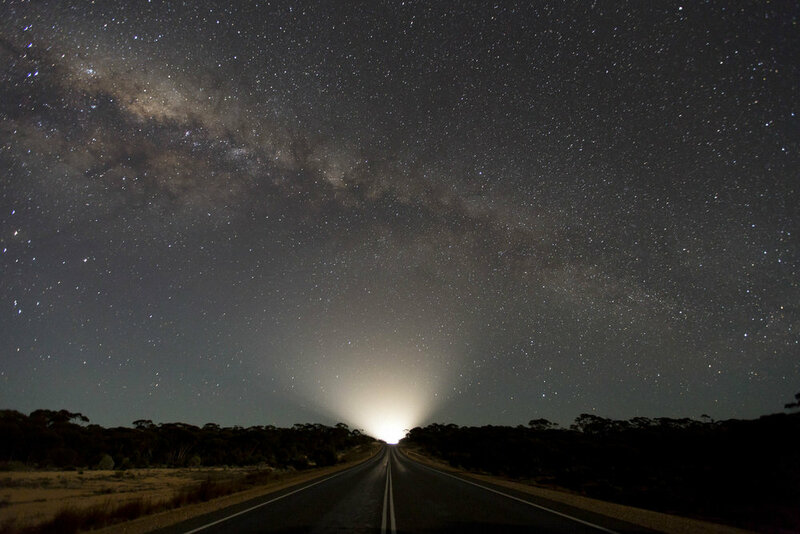 The night sky on the Nullarbor Plain near the Western Australian roadhouse of Balladonia. Early morning at the Caiguna roadhouse, Caiguna, Western Australia. Jeremy Burrows and his parrot "Thoth" at the Great Australian Bight, South Australia, Australia. India "Indy" Hayward with her son Vincent at the Coclebiddy roadhouse, Cocklebiddy, Western Australia. 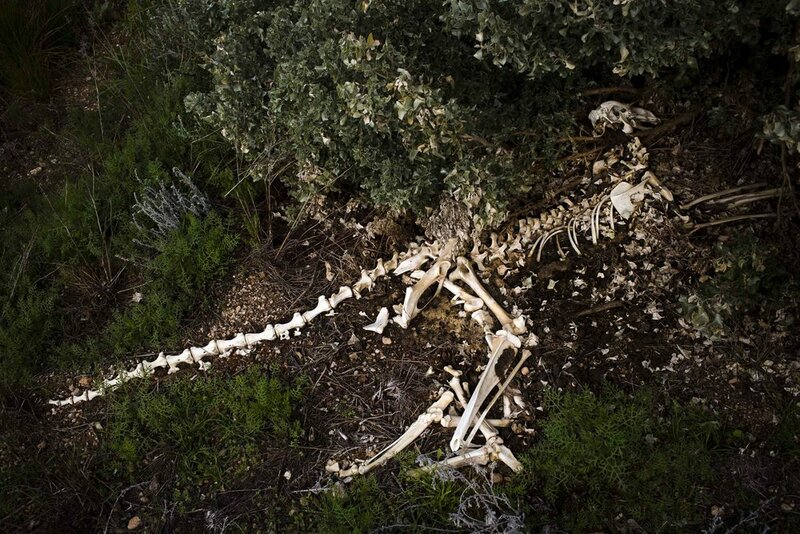 The skeleton of a kangaroo on the side of the Eyre Highway near Madura, Western Australia. Jason McIntosh and his bus named "the Strawberry Cow", Balladonia, Western Australia. 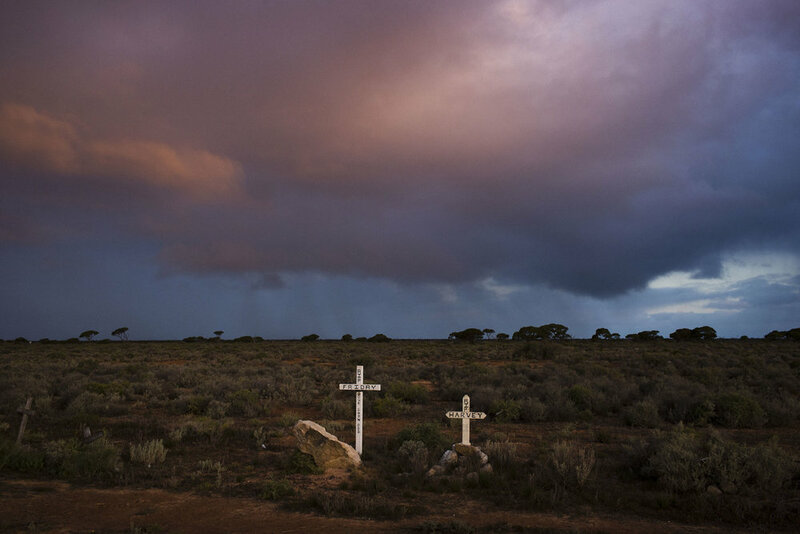 A pet cemetary on the side of the Eyre Highway, Madura, Western Australia. 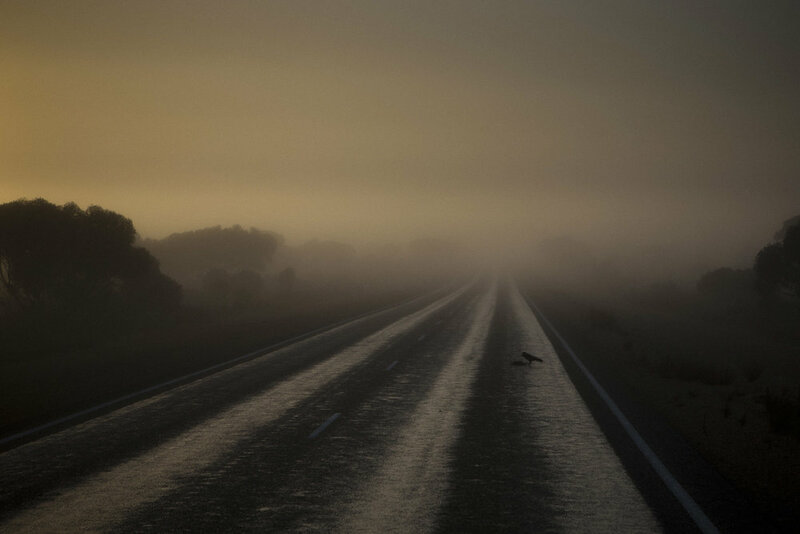 A crow picks at road-kill in the early morning fog on the Eyre highway, Caiguna, Western Australia. A fogbow caused by morning mist, Caiguna, Western Australia. Road workers re-surfacing the Eyre Highway, Cocklebiddy, Western Australia. Benjamin Campbell with one of the horses his family keeps on the Mundrabilla Station, Madura, Western Australia. 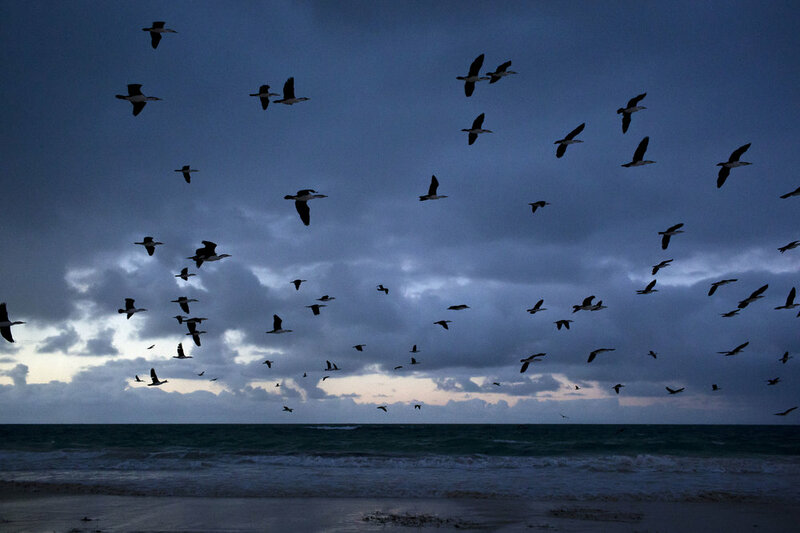 Seabirds known as Shags take flight at dawn at the beach, Eucla, Western Australia. 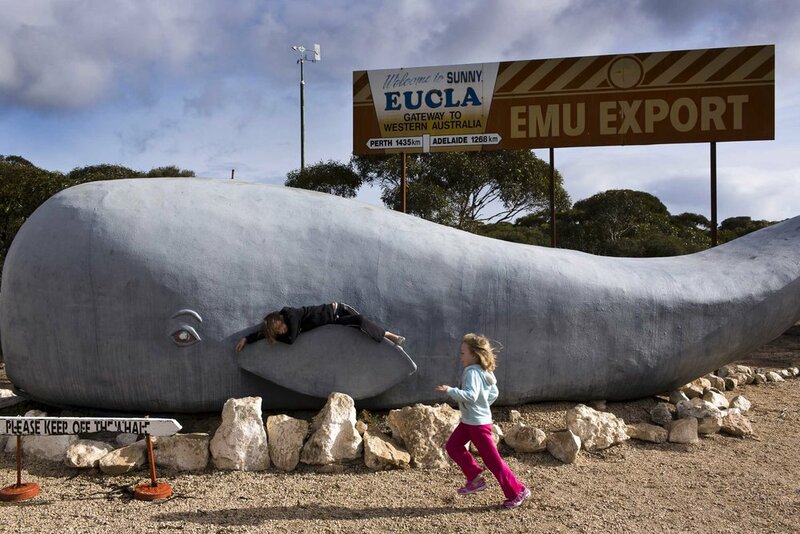 Children play on a whale statue in the Western Australian town of Eucla along the Eyre Highway, Eucla, Western Australia. A truck driver inspects the tires on his trailer while stopped at the Nullarbor Roadhouse, Nullarbor, South Australia. 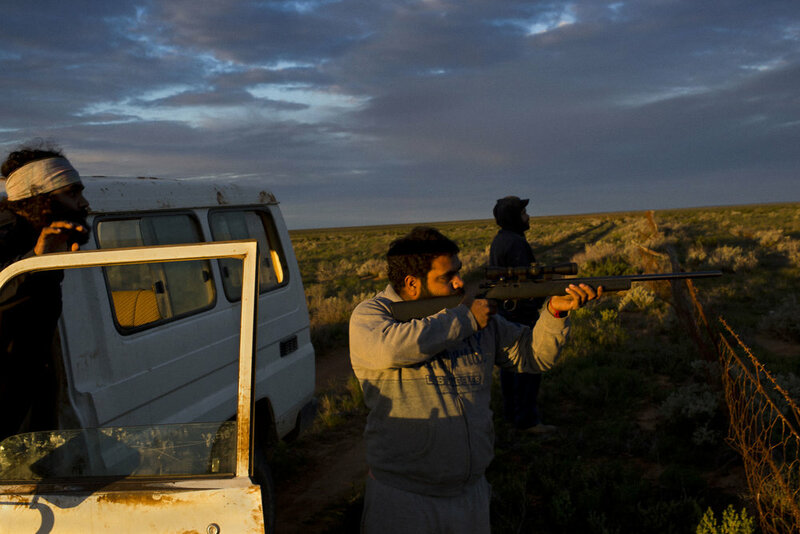 Pitjantjatjara Aboriginal men hunting on the Nullarbor Plain near their community of Yalata, South Australia. An abandoned car on the old Eyre highway near Yalata, South Australia. Pitjantjatjara Aboriginal men look at ancient paintings in a cave on the Nullarbor Plain, Yalata, South Australia.